Posted on 28, October 2016 by EuropaWire PR Editors | This entry was posted in Environment, Science, United Kingdom and tagged aquaculture, Dr Adam Hughes, European aquaculture industry, IMTA, Integrated Multi-trophic Aquaculture, RESEARCH, SAMS, The Scottish Association for Marine Science. Bookmark the permalink. Oban, Scotland, 28-Oct-2016 — /EuropaWire/ — A developing form of aquaculture that sees seaweed and filter-feeding shellfish grown next to traditional fish farms can help deliver greater productivity and reduce environmental impact, say a research group led by SAMS researchers. The European-based researchers involved in the four-year IDREEM project, which ended this month, believe Integrated Multi-trophic Aquaculture (IMTA) could potentially address a number of challenges in the flat-lining European aquaculture industry. Whereas traditional aquaculture/mariculture practice typically sees different types of organisms grown separately, IMTA is a concept where different species are grown together in such a way that the invertebrates and/or plants can recycle the nutrients that are lost from the culture of the other species. 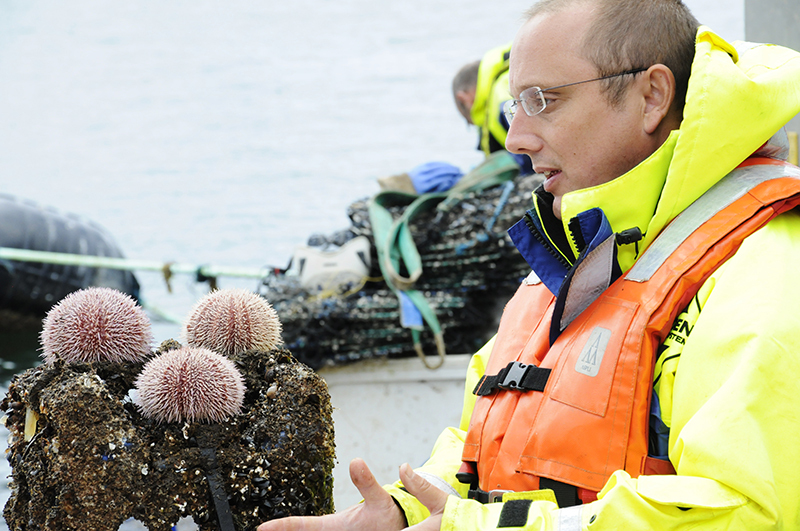 “The whole idea of IDREEM was to put the industry at the centre of the project,” said project co-ordinator Dr Adam Hughes (pictured), head of aquaculture at SAMS. “It wasn’t about just research, but rather about mapping and benchmarking industry as it developed different IMTA production systems in Europe. The work carried out by 15 partners across Europe has gone a long way to develop IMTA into a practical proposition for European aquaculture. Through the life of the project seven different fin-fish producers have IMTA operations in place, and the first IMTA products have been brought to market and sold. Among the findings from the project was a need to develop a market for aquaculture seaweed in Europe, as seaweed is a crucial component of most IMTA systems. For seaweeds to make a significant contribution to nutrient reduction they need to be grown in larger volumes than has been practised to date. The findings from IDREEM are detaileded in the final project publication “Beyond Monoculture – Developing Integrated Multi-trophic Aquaculture in Europe”, which was released on the occasion of the IMTA session at the recent Aquaculture Europe 2016 in Edinburgh. BBC Scotland’s Landward produced a feature on IMTA following a visit with Dr Hughes to the IMTA site on Loch Fyne, Argyll, run by the Scottish Salmon Company, a commercial partner in the IDREEM project. It can be viewed here on BBC iPlayer until November 25. IDREEM (Increasing Industrial Resource Efficiency in European Mariculture) is a European research project launched in 2012 to protect the long-term sustainability of European aquaculture by developing and demonstrating a new innovative production technology, Integrated Multi-Trophic Aquaculture or IMTA. The €5.7 million project is coordinated by the Scottish Association for Marine Science (SAMS) and delivered in collaboration with fourteen industrial and research partners from across Europe. The project has received funding from the European Union’s Seventh Framework Programme for research, technological development and demonstration under grant agreement no. 308571.